Writer Natalie Diaz first came to Blast Furnace's attention at the 2011 Association of Writers and Writing Programs (AWP) Conference in Washington, DC. She, along with other poets including L. Lamar Wilson (previously interviewed in this journal) were featured readers of their works at a session entitled "Courting Risk: A Multicultural/Multi-Genre Reading." After the reading, Blast Furnace approached Natalie to ask about purchasing a book of her poetry. At that time, however, a book was not yet available. Recently, her first full-length collection, When My Brother Was an Aztec, was published by Copper Canyon Press. Born and raised on the Fort Mojave Indian Reservation, Natalie is of Pima, Mojave and Spanish heritage. Her Alma mater is Old Dominion University (ODU), where she attended college on a full athletic scholarship. Her skill on the court provided her the experience of playing professional basketball in Austria, Portugal, Spain, Sweden, and Turkey. She later returned to ODU to pursue a Master of Fine Arts (MFA) in writing. Natalie's writing has been featured in Praire Schooner, Iowa Review, and Crab Orchard Review, among others. 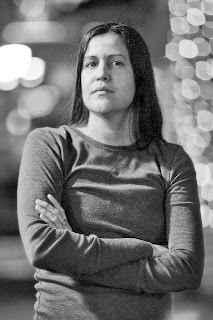 Her work was selected by Natasha Tretheway for Best New Poets, and she is a past recipient of the Nimrod/Hardman Pablo Neruda Prize for Poetry. Following is Part 1 of a two-part interview with the writer. Part 2 will be featured in a future edition of Blast Furnace. How were you introduced to the sport of basketball? Who were your opponents when you were learning the sport? I learned the game on the reservation, which means I am a run-and-gun type of player. I like a fast-paced, up-tempo game. I was a very physical defensive player. My older brother, the brother I often find myself writing about, spent a ton of hours in the driveway with me, shooting baskets, blocking my shots. He never took it easy on me because, he said, nobody else will either. He was right. He made me stronger. What kind of student were you in school? Were you always interested and adept at writing? When did you first realize you had a talent for it? Were you a fan of specific books or poems during your childhood/adolescence? What or who were/are your influences? I was an early reader. I read all of my grandmother’s Danielle Steel books when I was about ten. I’m still in love with Armand de Villiers, one of Steel’s characters. My grandfather used to tell me that I’d get my p’s and q’s mixed up from reading those books. I also loved reading National Geographic, comic books, and MAD Magazine. It’s true, my p’s and q’s are mixed up, but most likely as a result of the National Geographic mags. Did the decision to pursue writing come easily? Did you have a concentration in teaching? Poetry? Fiction? Other genres? I was playing basketball overseas when I first began to toy with the idea of writing. While I was in Europe and Asia, I kept in touch with Tim Seibles and a few of my other Old Dominion undergraduate professors. One day, I sent Tim some poems, which led to a few email exchanges about the possibility of pursuing poetry or writing. However, back then my mind was full of basketball and wandering. When I finally blew out my knee, I figured it was a sign to try something new (I manage to chalk everything up to a sign or a meant-to-be of some sort), so I enrolled in the MFA program at ODU—it gave me the time to focus on writing, something I hadn’t allowed myself to do before then. In comparing basketball to poetry, you say "You can exaggerate, embellish, imagine or lie about what happens in a poem." When you write poetry, what do you find yourself doing most out of that list of possibilities? Is it mostly truth-telling and writing what you know/what you've experienced? I think there are many ways to arrive at truth, and one of those ways is telling the truth. However, there are other ways of finding truth—for me, imagining all of the things that could have happened, almost happened, or have yet to happen will help me show you what actually happened. For example, I can give you an apple and say, This is an apple. But that won’t mean anything to you. Now, if I tell you all the things that apple is not, or tell you all of the things that apple is like, or tell you what the tree had to sacrifice to build that apple, or even stick a Black Cat firecracker in the apple and blow it up and show you all the pieces that apple is made from, then maybe, you will learn a little more about what that apple means to me, or more importantly, what it means to you. You also mention, in your basketball to poetry comparison, that basketball is a universal language. Largely, I hear this about love and music. Could you elaborate on how basketball is a universal language, from your perspective? ______ is a universal language. I think you can probably substitute any word there. Maybe what I mean is that basketball is a physical thing, a body thing—the physical language of the game is a language I understand and trust. On the court, we can act instead of speak. You always know where you stand on a basketball court—you never have to guess if you are winning or losing. Basketball is straightforward. If the ball goes in the hoop, it’s two points on the rez, in Madrid, or in Istanbul. In a world that is so wishy washy, I miss the straightforward, physical gauge that basketball provided me with. Plus, unlike with poetry, when Blake Griffith makes a power dunk, nobody says, He seems so angry at the white oppressors, or Now what do you think he meant by that? You write of basketball "If your fingers aren't broken, if your nose isn't bleeding, get out there." Has this happened to you on the court? Has it happened to you when writing a poem? My first book was a little painful, but not in an injury sort of way. Mostly in a I-still-have-to-look-my-brother-in-the-eye sort of way. As far as injuries go, I stub toes frequently, you know, rounding the desk corner in a blaze of finished poem glory. Do you consider yourself competitive off the court; for example, in the writing field? Have you experienced this? Or did it ever present itself in other ways to you? I was once pretty competitive, but that was when there was something to win, when there was an opponent to win it from. It was easy for me to leave that side of me back on the court. I am always surprised when I experience something like competition in the writing world. It is even a little hilarious for me. What is there to win? And if I win, who lost? And if writing is competition, shouldn’t it provide some sort of exercise? Because I’ve been writing and writing, and I still have a beer belly. You were a champion H-O-R-S-E player, a game of constraints. Have you ever attempted to put constraints on your writing—say, in attempting traditional form poetry—as a type of challenge for yourself? If so, what were the results? I often write in form early on in a poem, even though the poems don’t usually end up in form. This usually helps me realize what a poem is made of. I box it in a little and see how it behaves. Of the genres of poetry and fiction, what takes the most discipline for you? What type of fiction do you most enjoy writing (i.e., realistic fiction/drama, comedy, children's or young adult fiction, science fiction, etc.)? Would you say that your fiction is a major departure—in voice and subject matter—from your poetry, or is your voice of a similar consistency in both genres? One of the biggest factors that determines if I write a poem or a fiction story is time. Fiction definitely requires more time. My fiction strays a little from traditional plot structures—I like experimenting. I’m a big fan of Borges. When I read him, I feel like I can do whatever I want in a story. My dog’s name is Jorge Luis—well, he’s actually a chupacabra, but he is striped like a tiger, a Borges tiger. Talk about the Mojave language revitalization project you are leading. What do you feel you will lose if you lose this language? What has been accomplished thus far in the project? How will it be an ongoing effort? What do you hope it will yield (other than the preservation of the language, what benefits do you foresee in doing so)? If the language were to fade or to become silent, we would lose the ways to express our emotions and to speak of our families. We would lose the ways we tease each other, the way a grandmother scolds her grandchildren. We would lose all of our dirty jokes. If we lose our language, we will lose a large chunk of our identity. One of the first things we teach our learners to say in the Mojave language is, “I am Mojave.” There is a power in saying who you are in your heritage language, in naming yourself by the name you were created with, instead of calling yourself by the misunderstood, mispronounced label that early explorers and settlers called you by. ‘Aha Makav is the true name of the Mojave people. When our learners say, “Inyech ‘Aha Makavch ithuum,” they are becoming who the creator made them to be, who they truly are. Our language efforts are part of helping our young men and women to be proud of who they are, and this pride can help strengthen them when battling some of the darker realities of reservation life. What fuels your writing, particularly your poems? More specifically, is it emotions, experiences, history, other? How has your experience in the Mojave language preservation project impacted your own writing? Have you considered creating translations of your own writing into the Mojave language? I have started using more of the Mojave language in my writing. I have been learning it for the last two years, but I keep it pretty protected. I use it to say the things I cannot say in English, truly Mojave things, the powerful things that English is not strong enough to hold. So far, I am able to avoid forcing it to say the things I say in English. It has deepened my vision when I write, similar to the way Spanish works in my writing. When you think about the word for a thing in three different languages, you gain a more dynamic picture of it, you are able to come to it by new paths, and this helps me to realize it more clearly. How does "place" influence your writing craft and content? Place, specifically the desert and the river, often become their own characters in my work, especially in my fiction. The way I perceive the world is through eyes formed in this desert landscape I grew up in. When you say spring, I imagine bright-faced roadrunners flirting on the back dirt roads, electric green mesquite trees big as cathedrals and rocking with Gamble quail fat and rusty like bells. Because this is my home. This is what I know, if I know anything at all. And the reservation in general, as well as the Fort Mojave reservation specifically, are places where my poems wander around. Why do you think it is that you have "seen a dark sense of humor emerge" when you write about difficult subjects? Does humor allow you to be more honest? If so, how? I think many people don’t interpret humor in my work, but I feel like it is there. Maybe this is because I don’t have to flinch so much at some of the darker images that I write about, images that are new to my reader and therefore a little more shocking. Or, maybe it is because I have to carry humor in me in order to look certain images in the eye. Or, maybe I’m just not as funny as I think I am. However, Mojave people are big, deep laughers and relentless teasers, and I think I have that in me—the gift of being able to laugh when we need to most. What a gorgeous description of place, Natalie! I love the idea of your poems wandering around the reservation. Fantastic! Great interview! I think your ideas about humor are right on. It allows the writer to take a step back and write the darker images without getting lost in that darkness. The Portuguese writer, Saramago, was a master at doing this. Did you play the 4?